an instrument used to obtain an enlarged image of small objects and reveal details of structure not otherwise distinguishable. The light path of a darkfield microscope. From Hart and Shears, 1997.
acoustic microscope one using very high frequency ultrasound waves, which are focused on the object; the reflected beam is converted to an image by electronic processing. binocular microscope one with two eyepieces, permitting use of both eyes simultaneously. compound microscope one consisting of two lens systems whereby the image formed by the system near the object is magnified by the one nearer the eye. darkfield microscope one so constructed that illumination is from the side of the field so that details appear light against a dark background. electron microscope one in which an electron beam, instead of light, forms an image for viewing, allowing much greater magnification and resolution. The image may be viewed on a fluorescent screen or may be photographed. Types include scanning and transmission electron microscopes. fluorescence microscope one used for the examination of specimens stained with fluorochromes or fluorochrome complexes, e.g., a fluorescein-labeled antibody, which fluoresces in ultraviolet light. light microscope one in which the specimen is viewed under ordinary illumination. operating microscope one designed for use in performance of delicate surgical procedures, e.g., on the middle ear or small vessels of the heart. phase microscope (phase-contrast microscope) a microscope that alters the phase relationships of the light passing through and that passing around the object, the contrast permitting visualization of the object without the necessity for staining or other special preparation. scanning electron microscope (SEM) an electron microscope that produces a high magnification image of the surface of a metal-coated specimen by scanning an electron beam and building an image from the electrons reflected at each point. simple microscope one that consists of a single lens. slit lamp microscope a corneal microscope with a special attachment that permits examination of the endothelium on the posterior surface of the cornea. stereoscopic microscope a binocular microscope modified to give a three-dimensional view of the specimen. transmission electron microscope (TEM) an electron microscope that produces highly magnified images of ultrathin tissue sections or other specimens. An electron beam passes through the metal-impregnated specimen and is focused by magnetic lenses into an image. x-ray microscope one in which x-rays are used instead of light, the image usually being reproduced on film. a binocular microscope used to obtain good visualization of fine structures in the operating field; in the standing type of microscope, a motorized zoom lens system operated by hand or foot controls provides an adjustable working distance; in headborne models, interchangeable oculars provide the magnification needed. a binocular microscope used in delicate surgery, especially surgery of the eye or ear. The standing type of operating microscope has a motorized zoom system operated by a foot pedal that quickly changes the magnification. The operating microscope that attaches to a surgeon's head has interchangeable lenses for different magnifications. Also called surgical microscope. A binocular, low-powered microscope with coaxial lighting and foot controls for focus, zoom magnification and X and Y shift used by surgeons to permit a degree of surgical precision not otherwise obtainable. Operating microscopes are most used by OPHTHALMOLOGISTS, ENT SURGEONS, VASCULAR SURGEONS and GYNAECOLOGISTS. one using very high frequency ultrasound waves, which are focused on the object; the reflected beam is converted to an image by electronic processing. one with two eyepieces, permitting use of both eyes simultaneously. the standard bench microscope used in histology and requiring stained tissue sections. the standard laboratory microscope used in veterinary science; consists of a two lens system whereby the image formed by the system near the object (objective) is magnified by the one nearer the eye (eyepiece). 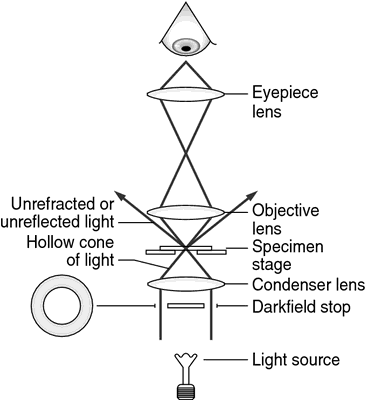 used for examining unstained, often living cells, in which light is only directed into the objective lens if it is deflected by an object in its path. The object is thus viewed as a white structure in an otherwise black (darkfield) background. one using an electron beam of very short wavelength as the source of illumination. It has a resolving power of 2 nm (which is 100 times greater than with the light microscope). Includes the transmission electron microscope and the scanning electron microscope (below). See also immunoelectron microscopy. one used for the examination of specimens stained with fluorochromes or fluorochrome complexes, e.g. a fluorescein-labeled antibody, which fluoresces in ultraviolet light. See also fluorescence microscopy. a microscope similar to the phase contrast microscope but delivers a three-dimensional image. Called also Nomarski interference phase microscope. used for examining unstained or stained particles or the cellular structure of tissues that have been cut into sections and stained. It has a resolving power of 0.2 μm. Modern light microscopes have an eyepiece and objective lenses which provide magnification, and a condenser beneath the stage which gathers and focuses light on the object being examined. one designed for use in performance of delicate surgical procedures, e.g. on the middle ear, eye or small vessels of the heart. a form of light microscope useful for examining living, unstained structures, including animal cells and bacteria, e.g. leptospira. The phase of the light wave passing through different structures in the cell, e.g. nucleus vs. thin part of the cytoplasm, is changed by different amounts and thereby provides contrast. based on the phenomenon of birefringence; useful in the study of bone and muscle. an electron microscope that produces a high-magnification image of the surface of a metal-coated specimen (shadow casting) by scanning an electron beam and building up an image from the electrons reflected at each point. Particularly useful for determining the three-dimensional structure of objects. one that consists of a single lens. one used in the examination of the corneal endothelium. a binocular microscope modified to give a three-dimensional view of the specimen. one that resembles an inverted light microscope in that the beam of electrons generated from a heated filament at the top of the instrument passes down through a column where it is focused by magnetic coils (lenses) and is differentially scattered when it passes through the specimen. The image is recorded either on a photographic plate or on a phosphorescent screen. uses an ultraviolet light source; useful in histochemical studies; only photographic images are available. Recently the Den- tal operating microscope was introduced to endodontics and has significantly improved magnification and illumination. Tender notice number : E-146/Opthalmic Operating Microscope with Monitor. the subject of the public contract is the delivery of one piece of the operating microscope for the preparation of teeth and root canal treatment with a binocular attachment with a straight binocular extension. Yanoff and the QuickTV crew on the monitor of his operating microscope. Tenders are invited for Supply of E-66 operating microscope. Tenders are invited for Procurement of ent operating microscope. Tenders are invited for Supply, installation and commissioning of operating microscope for central hospital, bccl with one year of warranty- guarantee period.